January 04, 2017, New York, NY — Founders Entertainment is proud to announce the lineup for the 2017 Governors Ball Music Festival. The seventh annual edition of New York City’s very own homegrown fest will take place from Friday, June 2nd through Sunday, June 4th on beautiful Randall’s Island Park. Featuring performances from Tool (the band’s first NYC performance in 11 years will be a full-length set with complete tour production), Chance The Rapper, Phoenix, Childish Gambino (a rare live performance for the artist in 2017), Lorde, Flume, Wu-Tang Clan, Logic, Wiz Khalifa, Beach House, Air, The Avalanches, The Head And The Heart, Tove Lo, and many more, Governors Ball will play host to 65+ artists throughout the weekend. 3-day GA and VIP tickets (including payment plan options) are available starting Friday, January 6th at 12 noon EST via GovBall.com. Full festival lineup and poster below. This June, live music fans will experience the best Governors Ball yet, as the once upstart music festival celebrates its seventh consecutive year as New York City’s premiere live music event, and by acclamation, one of the top music festivals in North America. Governors Ball 2017 will feature redesigned VIP amenities and locations, a signature lineup of the best food NYC has to offer curated by The Infatuation, an expanded selection of craft beer options, and the lawn games, mini golf (two unique 18 hole courses), street art, After Dark concert series, and that “only in New York” concrete jungle vibe “Gov Ball” has become known and loved for. Another new addition to the Governors Ball 2017 festival site will be a 21+ oasis open to all 21+ ticket holders, where those in need of a respite from the action, and a refreshing beverage to go with it, can catch some shade while they recharge for the next set on their schedule. In addition to the newly added 21+ GA area, all VIP areas at Governors Ball 2017 will be 21+ as well. Governors Ball will once again focus on giving back to the greater New York City community with the 2017 festival. Helmed by born and bred New Yorkers, Founders Entertainment will look to build upon their efforts surrounding last year’s festival. 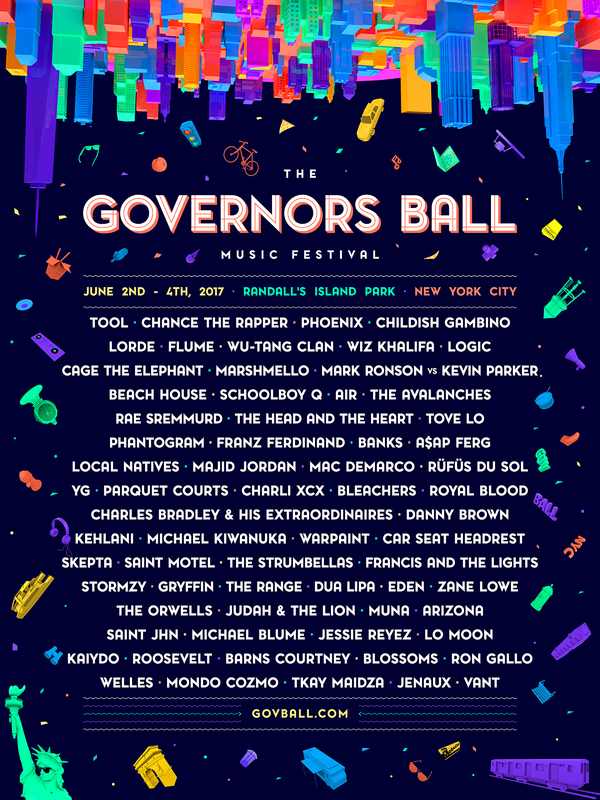 In 2016 Governors Ball generated $37.5 million in economic benefits for New york City, bringing the past three years cumulative total (2014-2016) to $125+ million dollars. The festival also continued its long track record of giving back to the community by working with and donating to local organizations, non-profits, and community groups. In addition to direct donations to organizations like the Mayor’s Fund to Advance New York City, Founders Entertainment encouraged festival goers to give back to the community by offering GA tickets to Governors Ball 2016 in exchange for volunteer hours at local non-for-profit food programs. Eighty volunteers completed approximately 25-27 hours each for various organizations including the Salvation Army, Food Bank for NYC, NY Common Pantry, Project Find, and the Randall’s Island Park Alliance to help reduce hunger and improve the lives of New Yorkers in need. More information on Governors Ball’s economic impact and community engagement may be found here. Founders Entertainment is once again honored to invite attendees to Governors Ball’s festival grounds at Randall’s Island Park (supported, maintained and programmed by the Randall’s Island Park Alliance www.randallsisland.org). In addition to being accessible by MTA bus, bike, cab, and ferry service from Mid-Town Manhattan to and from the festival grounds, the festival is accessible to pedestrians via the RFK Bridge, the 103rd street footbridge, and Bronx Randall’s Island Connector.